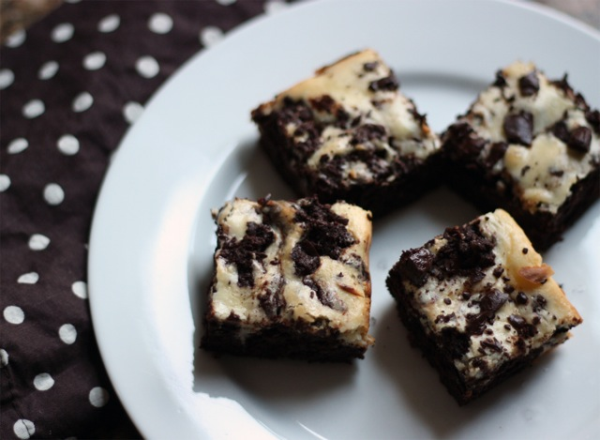 Best Brownies Recipe: Chocolate Cream Cheese Brownies – Get Cooking! Spice Islands has just released two new Sea Salts: All-Natural Fine Mediterranean Sea Salt and All-Natural Coarse Mediterranean Sea Salt. I’m thrilled to see the All-Natural Fine Mediterranean Sea Salt. The problem with sea salt has always been that it’s sometimes temperamental in recipes… too chunky! The new All-Natural Fine Mediterranean Sea Salt is the answer to baker’s prayers and I can’t wait to stock up on it. It’s used in the brownies recipe below and my mouth is watering. I also LOVE that the recipe calls for two of my favorite things in the whole world: Chocolate and Cream Cheese. I even have special categories on my food blog for cream cheese recipes and chocolate recipes. I’ve had a lifelong passion for each, and when they team up, it’s nothing short of culinary magic. Prepare a 9-inch square baking pan by buttering the bottom and then using two pieces of parchment paper crisscrossed over the bottom and up over the sides. Chop the semi-sweet chocolate into small chunks. Reserve 1/4 cup to sprinkle over the top of the brownies. In a double boiler, melt the butter and the chocolate over simmering water. Meanwhile, in a bowl, combine flour, cocoa powder, baking powder and salt. Use a whisk to combine the dry ingredients well. When the butter and chocolate are melted, remove them from heat and stir in the sugar. Lightly beat 2 eggs in a bowl, and then mix them into the bowl along with the vanilla extract. Stir the dry ingredients into the wet ingredients using a rubber spatula or spoon mixing just until incorporated. Do not over mix or use an electric mixer! To prepare the cream cheese mixture, mix softened cream cheese with 1/3 cup sugar. Add the egg and mix well. Put dollops of brownie mixture in the pan and follow with spoonfuls of cream cheese mixture. Use a knife, moving it back and forth to swirl the two mixtures. Sprinkle reserved chocolate pieces on top. Bake in the oven for 40-45 minutes or until a toothpick inserted comes out with moist crumbs. It should not be dry. Cool in the pan for 15 minutes. Use the overhanging parchment paper to remove the brownies and let cool completely before cutting. Oh! Nuts and Oh! Candy and Oh! My!